Six Course Food & Wine Meal!! Wine as they called it nectar of gods has a rich history in India right from Indus Valley Civilization called as Somrasa (Linking it to God Shiva who prefers it) but as these civilizations got vanished went we forgot that rich history of wines with advent of time. With advent of globalization, We again became aware of wines as a concept. Indian food also evolved from the ancient times and being a non drinking country our menu rarely had wines to go with it except for a few royal cuisines! 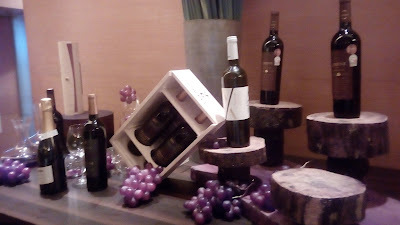 Wine in India is mainly made in the 2 regions of India. Owing to their climate which is cool and provides right sun, rain and shadow (yes shadow is needed to make a good wine) which supports making best wines Nashik and Bangalore with Nashik having majority of Vineyards. Vines which are used are of French origins planted in India and are selected bunch to suit Indian climate and preferences. 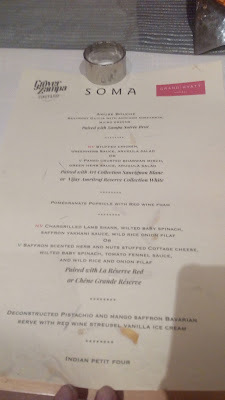 When it comes to Wine and food there are a lot of combinations that go well and personally i'm of opinion its the matter of personal taste when Wine & Food is involved. So when Grover Zampa (Who are known for their award winning wines) invited me for a Wine Dinner (Which i was told would be Indian) i just couldn't say No as i was looking for a rare combination of Wines with Indian Fusion cuisine (Which many rarely get right!). 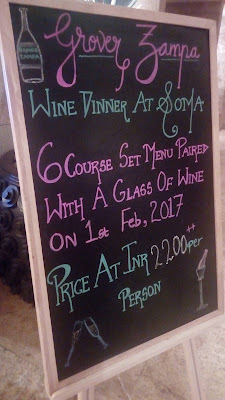 Grover Zampa who make superb array of wines from Bangalore as well nashik were the organizers of this Wine dinner for us. 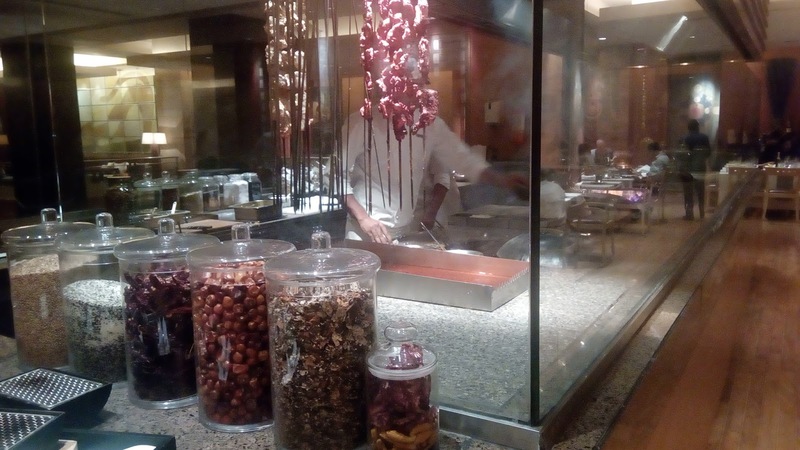 Soma in turn Grand Hyatt being a gracious host to us and Grover Zampa making an experience for us truly. 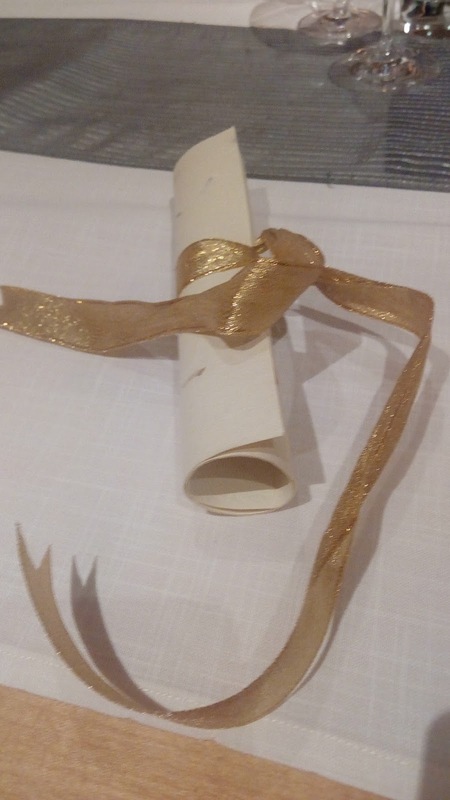 As i was informed later wine notes were shared and Menu was decided to make the meal superb. 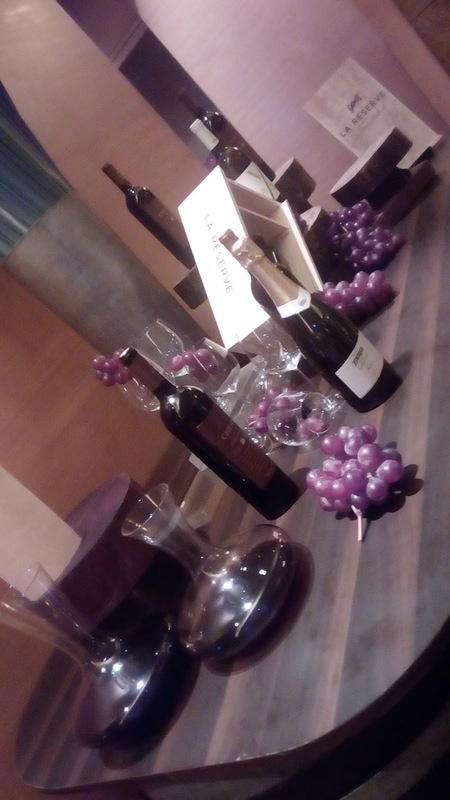 Dazzling Array of Wines courtesy Grover Zampa! The Super Menu & Wine collaboration just to make it perfect Dinner! 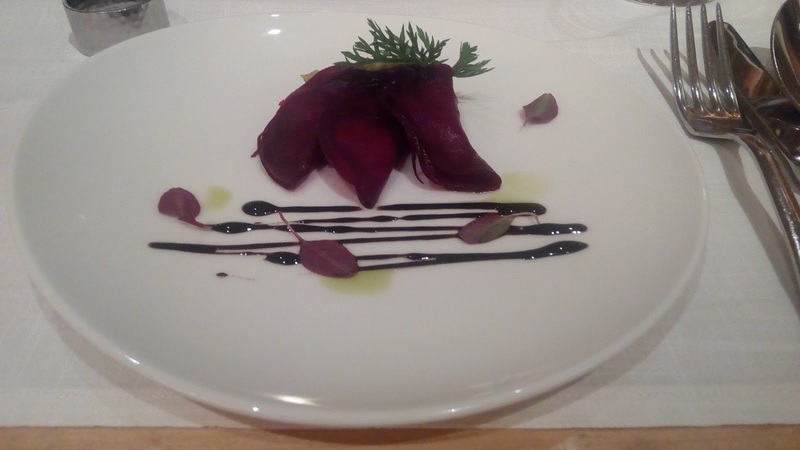 A wonderful Amuse Bouche with sparkling wine Soiree Brut. The Beetroot Gujiya with Avocado Koshimbir with micro greens, the Gujiya were just perfect with that Avocado Koshimbir with the greens they perfectly complimented each other & that with the sparkling wine just made the meal even more appetizing. Sparkling wine created a mouth feel which was perfect and made me salivate even more. With the taste buds ready to roll with the first course, We were ready to be amazed for the meal. 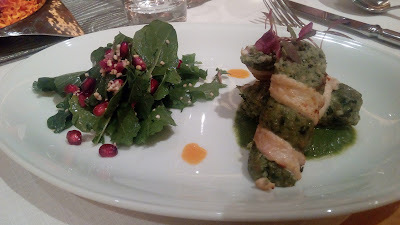 And we got a super second course of Stuffed Chicken Green Herb sauce with Arugula Salad served with Art Collection Sauvignon Blanc a delicate white wine. The Stuffed chicken and herb sauce just complimented each other really well with he addition of Aurugula Salad it was perfect to go with the Art Collection Sauvignon Blanc. 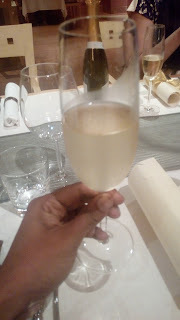 The White wine being delicate was perfect to go with Indian Chicken and salad just something which was needed as second course. This was a perfect course a Palate cleanser which we would have asked for a Pomogranate Popsicle (A lightly all natural pospsicle) with a foam of Red wine (La Reserva Red) - Quite a combination of Molecular Gastronomy with Wine. 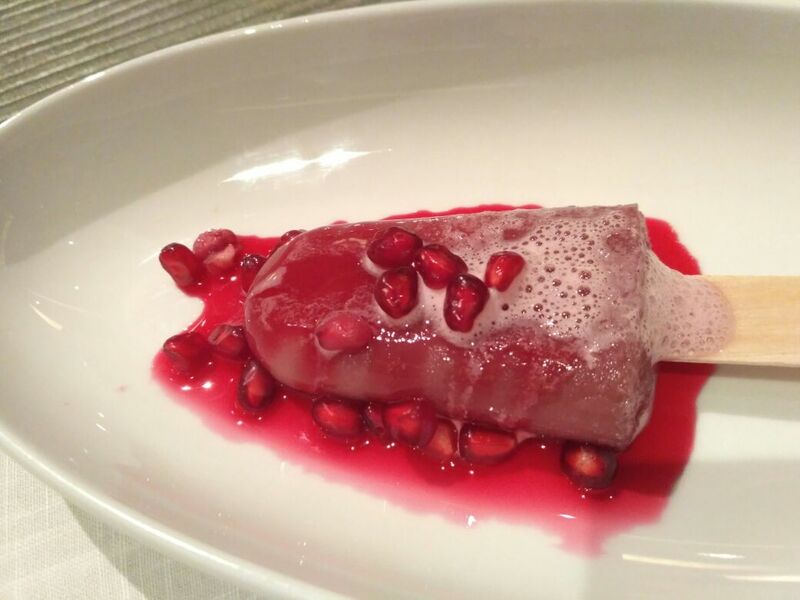 I personally loved it as it gave my palate a refreshing feeling making me salivate even more. This Next course an Dish with Char grilled Lamb Shank with Saffron Yakhani Sauce Wilted Baby Spinach and Wild Rice Onion Pilaf. Now this was one robust Indian dish with lamb and Pilaf with a Perfect La Reserva Red to go with it. 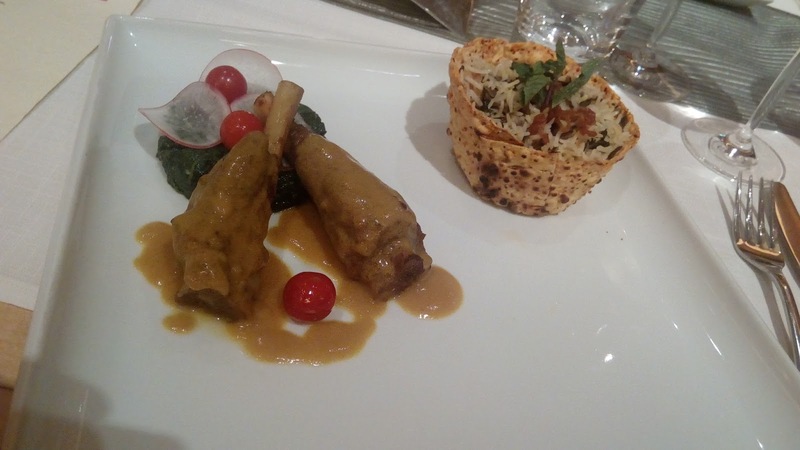 The Lamb which i first had was delicious to the core with tender meat cooked well and just perfectly grilled and served with Saffron Yakhani Sauce making it heavenly and a sip of Red wine with it just made it heavenly. Wilted baby spinach was perfect. The Pilaf was served in a cup made of Pilaf and the pilaf was very fragrant and flavourful with the taste of Wild rice (Yes this was Black Rice from Africa a rare kind used to make this pilaf) and onion coming through. The Red wine sips with this pilaf was making the taste of the pilaf to come through to the palate and complimenting each other well. Soma Where the Magical Meal was Made! Deconstructed Pistachio And Mango Saffron Bavarian Served with Red Wine Streusel Vanilla Ice cream. 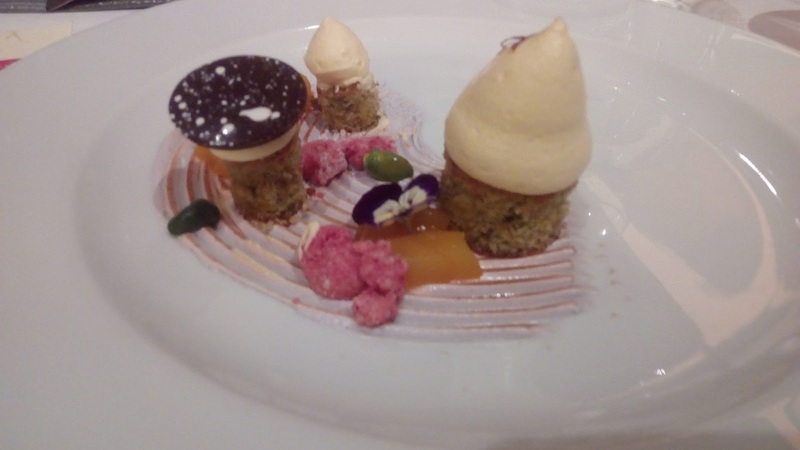 The Dessert course - The one which was specifically designed to go well with such a fab menu.The deconstruction pistachio and mango saffron bavarian was perfect after a fab meal. A unique dessert which was interesting to have with the wine (Sparkling wine which i had with it). 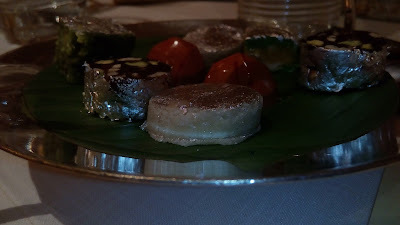 Indian Mithai as i would like to call them were perfect ending to this wine & food menu which we had. After such a superb meal it would be right to have something sweet (Indian Style). This was followed with a superb wine discussion with wine makers aka Team Grover Zampa. Where we were told about Wine making and the process that goes through in making a bottle of quality wine. 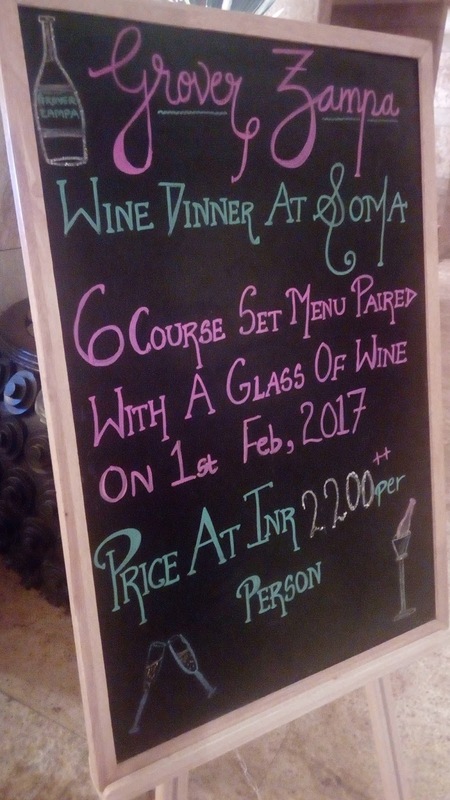 Such Menu's are perfect for those who seek a Fusion of Indian food with Wine. 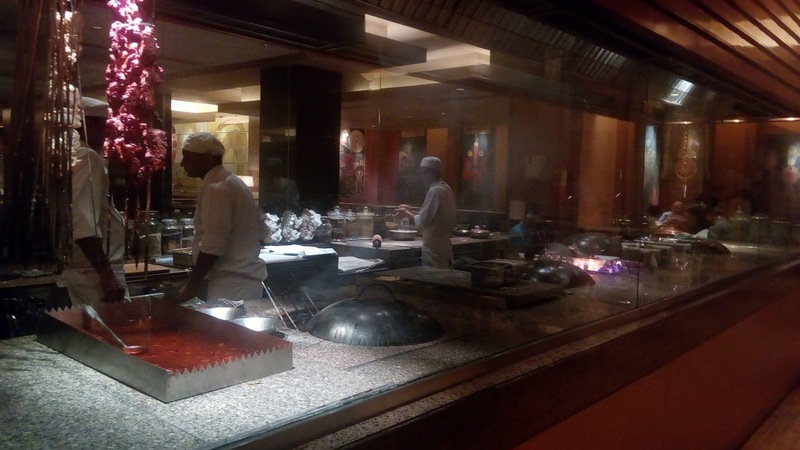 It doesn't matter you may be a novice in wine drinking or an expert traveler with a experience of wine such an Menu is ought to be tasted to understand nuances of wine to go with Indian food (Yes, You can pair Indian Food with specific wines, which one must try). With Such an array of Wines available at our disposal one can always give it a try. With Rs.2200/- per person its a super deal. Highly Recommended. Suggestion. : Don't Drink and Drive. Have a great meal with your wine and have a safe night always! P.S: You can share you comments in the comments section below or on Twitter / Facebook about your Food & Wine Paring.